Norman W. Bircher, Son, M, Wh, 8/12, sng, TX/PA/TX. Winnie Bircher died 10 Jun 1993 in Grayson Co., TX. Biography* � Edward Jackson Culpepper, whose stage name was Jack Pepper was a vaudevillian and Ginger Roger's first husband. They had a vaudeville act known as "Ginger and Pepper"
"Erwin has lived in Dallas, TX all his life except for a few years in WW-II. Our grandmother was Ollie J. McCallum, sister of Jack Culpepper's mother, Josephine Cheniworth Culpepper. Erwin is an artist and very good at what he does. He has gone from early Baptist Religious to Western Paintings. "Jack had a night club on Maple Avenue, where Erwin also lived. 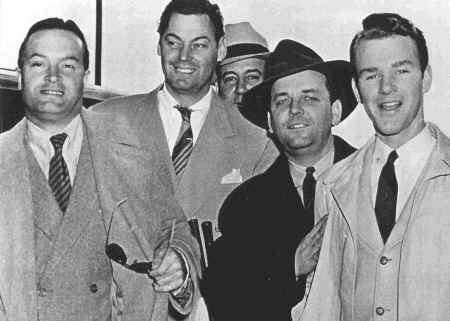 Jack called Erwin one day in 1940 and asked if he wanted to go to the airport with him and pick up Bob Hope and Johnny Weismuller. Erwin was 17 years old at the time. The photograph that I've provided was taken at that time. "Erwin said Jack and Bob were very close friends and that Jack fed and kept Bob in New York in the early days. Jack was a Broadway star when Bob was getting started. Erwin said Jack's famous quote was 'People won't pay good money to watch that flat screen. Of course, Jack did go to Hollywood, but never made it big. Erwin said Jack's ego got in his way; Bob tried to help him out, but Jack was always trying to tell the director how things should go. "Aunt Winnie Mae, Jack's sister, lived in Dallas and was married to Joe Bircher. Their son, Norman, is a friend of Erwin's. "Aunt Beulah Rae, also Jack's sister, lived in Dallas and was married to Glen McCallon. She was secretary to the Dallas City Manager for more years than I can remember." Rebecca Chenowith, Mother-in-Law, 67, WD, MO LA VA, Clerk. E-mail written 1999 to Warren L. Culpepper from Bill Beck, e-mail address. E-mail written Nov 2009 to Culpepper Connections from Robert Deanne Scott (#60857), e-mail address.